Review Summary: Non-stop laughathons are considered safe bet at the box-office. Non-stop laughathons are considered safe bet at the box-office. 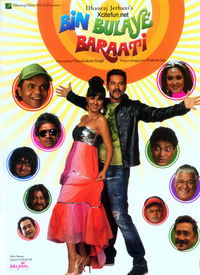 Bin Bulaye Baraati is a poor fare as it has precious little to offer except a few song-dances. It will fail at the ticket counters. There are set expectations from 'Bin Bulaye Baraati'. You know that it isn't a classic in the making and hence want two hours of timepass fun that doesn't allow you to tax your brains but instead surrender to the antics of a dozen odd comic players on the screen. Bin Bulaye Baraati is a senseless and imbecile film. Best avoided.